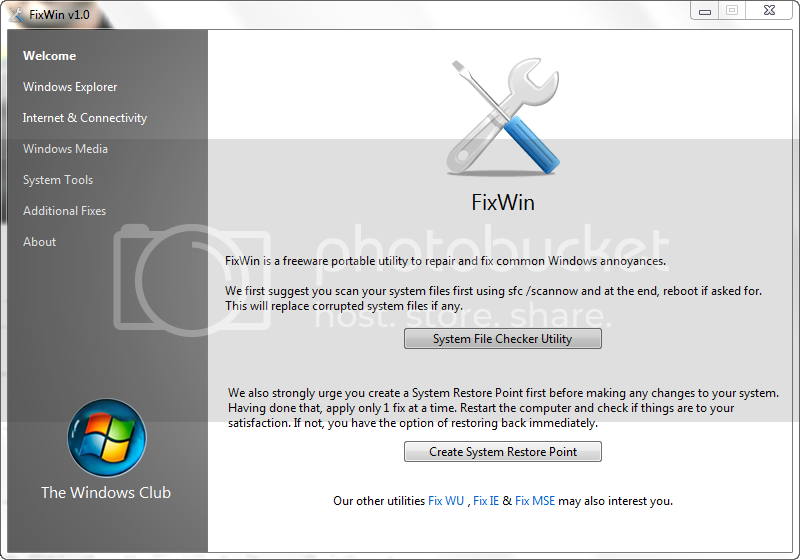 After so many applications from TheWindowsClub like UltimateWindowsTweaker, FixIE, FixWU, Fix MSE, Windows Access Panel and Prevent, now they are pleased to release a first-of-its-kind application for Windows 7 & Vista: FixWin. FixWin v 1.0 is a 529 KB freeware portable application to repair & fix common Windows annoyances & issues. The solutions to repair and fix 50 common Windows annoyances, issues, problems have been categorized under 5 tabs, viz : Windows Explorer, Internet & Connectivity, Windows Media, System Tools & Misc Additional Fixes. It has been tested on Windows 7 & Vista, 32-bit and 64-bit versions. 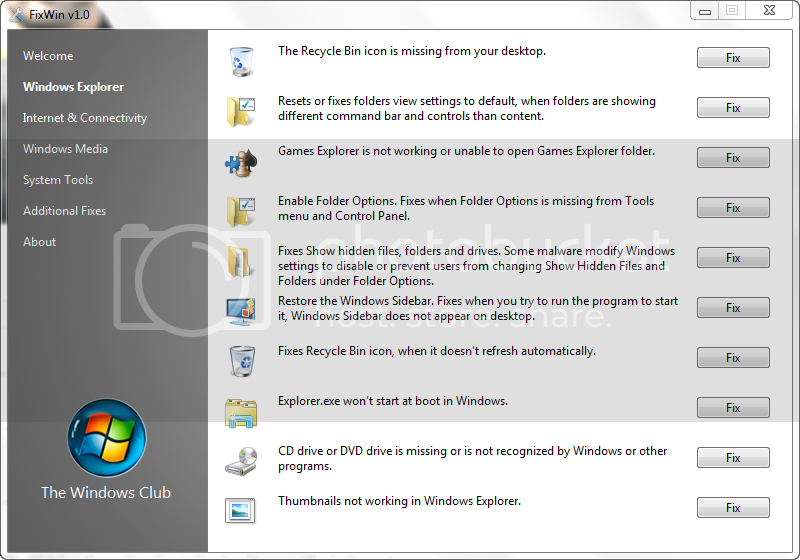 But it is recommended that you run the System File Checker Utility first and then you also create a System Restore Point. Having done that, apply at most one fix at a time and restart your computer. FixWin is freeware and can be freely used for any personal non-commercial purposes only. It is supplied “as-is”. The publisher or the author assumes no liability for damages, direct or consequential, which may result from the use of this software. 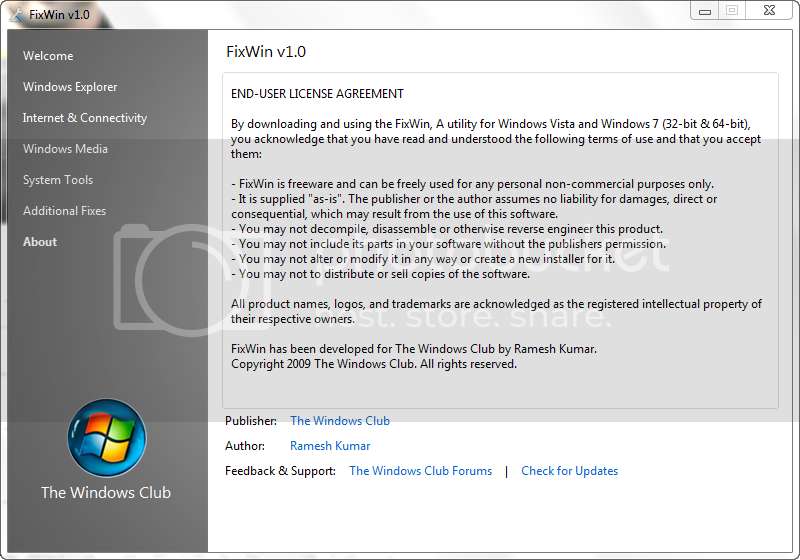 FixWin v 1.0 has been developed for The Windows Club by Ramesh Kumar.